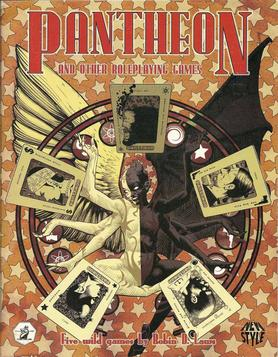 Pantheon by Robin Laws is his entry in the New Style series of offbeat, experimental RPGs and storygames that Hogshead Publishing put out in the late 1990s and early 2000s. It’s a GMless game based around the Narrative Cage Match rules – a shared-narration system. The way it works is that you go around the table and each player takes it in turns to add a sentence to the story you are collectively telling together. You have certain constraints (for example, your sentence can mention your own character and one other player character directly, but can’t affect every PC all at once), but the main thing stopping you from just saying whatever you like is that each player has a pool of tokens they can use to launch a challenge. Challenges work like this: everyone rolls 6D6 and sees how many matching numbers they get. They then bid tokens from their pool (which starts at 50) to auction the right to declare the “lucky number”. The winner of the contest is the person who has the largest set containing the “lucky number” (so if it’s 3 then the more 3s you rolled, the better off you are). The winner of the contest can choose to let the challenged sentence stand, or replace it with one mentioning the same PCs and including at least one noun or verb that was in the original sentence. Play continues until only one PC survives or until only one PC has any normal tokens left. They get to wrap up the story in a single sentence – or, for every ten normal tokens they have left, they can add a bonus sentence. Scoring then takes place, with players scoring points based on stuff that happened in the game; in general, the more genre-appropriate things happened, the better the score. This does mean that the survival of your PC isn’t necessarily your primary concern – if it would make sense in-genre for your PC to die in an appropriate way, having that happen may be the best way to score points. After explaining these simple rules, the rest of the booklet provides a set of scenarios to use them with, ranging from highly detailed genre exercises with clear character roles to the title scenario, where you start out in the darkness before creation and the story will be about how the PC gods created the universe and defined themselves and all that good stuff: for that one only the absolute bare minimum information is given, since by that point you should be adept enough with the system to make a go of it without training wheels. Now, the assumption is that you are going to play each of the scenarios at least once without anyone looking at the scoring sheets, though you can replay them with everyone having access to the scoring sheets if you wish – the main difference would be that with the goals visible to everyone they’re much more likely to twist the story in a direction to maximise their own score, whereas when the scores aren’t visible then everyone has to just guess what does and doesn’t earn them points. However, in giving Pantheon a test drive back in the day I found that if you don’t have the score sheet visible, it’s a little too easy for the game to drift in a direction where nobody ends up scoring very much at all – you’re too dependent on the group at the table accurately guessing what Robin Laws thinks is genre-appropriate action for the scenario in question. Perhaps the most vulnerable one to this is the Pantheon scenario itself; its initial premise is so extremely sparse that if the play group ends up producing an extremely unconventional creation myth then the scoring sheet may be mostly orthogonal to the action. Another advantage of having the scoring sheet visible, of course, is that it’d allow you to keep track of your score as the game progressed; conversely, if you’re playing with the score sheet unseen, you’d need to remember what happened during the story, which depending on how long and how complex it got could be tricky. (Remember, how long the story is depends largely on how conservative people are about challenging, and what they bid in the auctions during challenges.) Heck, I can easily imagine a sufficiently hard-negotiated auction dragging on just long enough that the participants end up hazy on what the sentence under dispute actually was! In some respects Pantheon seems like it’s a game best played over internet chat, provided you had a trustworthy group in terms of their die rolls and keeping track of their token totals; alternately, you may wish to actually write out each sentence of the story as it’s laid down so as to maintain consistency. The main restriction on Pantheon is its dependency on a prewritten score sheet; this is more acute if you prefer to play it without anyone seeing the score sheet the first time around you play a scenario, because then it means the scenario designer cannot participate in the game itself. To my knowledge, nobody’s ever bothered to come up with additional scenarios for it, or if they have they haven’t shared them on the Internet; one suspects that once you work through the scenarios in the book the Narrative Cage Match system exhausts its charm. Still, as an indie story game oddity it’s worth a look.